Custom fit Rubber Nib Backing comes with standard driver side heel pad. Can be ordered in two-piece set, four-piece set or full across for most truck and vans. 10 colors to choose from to match your automobile's interior. Can be embroidered in Block or Script letters. Custom-Fit Floor Mats Is The Best Way To Go. Made From Nylon Carpet 24 oz. 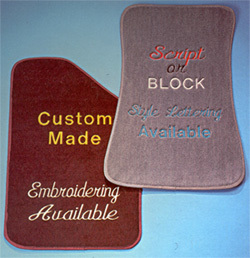 As An Option The Floor Mats Can Be Embroidered With Block Or Script Letters At $2.00 Per Letter Per Mat. Custom-Fit Floor Mats Are Non-Returnable Unless There Is A Manufacture Defect. If yes, what would you like imprinted on the each floor mat?